Clarice Lispector’s A hora da estrela (La hora de la estrella / The Hour of the Star) begins and ends with an affirmation: “All the world began with a yes” (11); “It’s strawberry season. Yes.” (96). But the two yeses are quite distinct. The first, at least in appearance, is quite profound: it is the story of cosmic genesis, a quasi-Biblical assertion of universality. The second, by contrast, seems to be much more insubstantial: the gourmand’s note about a fruit that happens to be available. Indeed, given what has taken place in the course of the novel and the ninety pages that separate these two lines, the second yes is if anything flippant or disingenuous. For we have just seen the book’s heroine, Macabéa, an impoverished, sickly, and practically friendless young woman immigrant from the countryside to Rio de Janeiro, be run over and senselessly die on a darkened city street. In this context, to lick one’s lips and head off for a punnet of strawberries and cream is evidence of a lack of compassion or even responsibility. And yet it is the same voice, the same narrator, who provides us with both affirmations. And indeed, beyond being merely a tale of life and death in urban Brazil, this novel is also very much concerned with the affects and debts that authors project onto their writing and their readers, and that readers in turn bear towards both the book and the world. So alongside and undercutting the affirmations are a series of questions and anxieties. This is an author who often does not seem all that sure of himself. For instance, before the book proper begins there is a “Dedication by the author” in which he reveals that “what trips up my life is writing” (8), and following which is a series of alternative titles for the book itself: “The Hour of the Star,” but also “It’s All My Fault,” “I Can’t Do Anything,” and “Cheap Tearjerker” (9). It’s as though it were up to the reader to be the final judge as to what the book should really be called, or as to whether the author has made the right decisions. Indeed, throughout, he turns to us to explain and justify himself where he can, and to throw himself on our mercy where he can’t or won’t. Even down to the issue of his heroine’s death, he is keen to stress his limits, his powerlessness: “Is perhaps Macabea going to die? How would I know?” (90). And when something does happen, his response–like Macabéa’s own resigned view of the world–is that that’s just the way things are. That’s fate, that’s (like the accident itself that mows Macabéa down) all part of life’s game of chance. So why, then, talk of blame at all? “Who am I,” the author asks, “to punish the guilty? The worst of it is that you have to forgive them. You have to get to such a point of nothingness that it’s a matter of indifference whether or not you love the criminal who kills you” (90). And if this is the lesson of the book, then it’s perhaps only Macabea herself who ever arrives at this point of bliss, such that she can forgive both the driver who kills her and the author who (for all his denials) has her killed. Meanwhile, all this talk of the author is in an important way seriously misleading. For however self-aware he may be about his role as a writer, what the author never seems fully to realize is that he, too, is but another character. 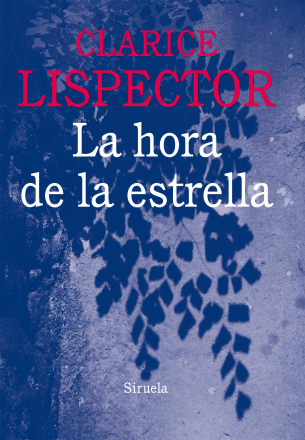 For the real author of La hora de la estrella is, of course, Clarice Lispector, who makes herself known only fleetingly: with the subtitle to the author’s dedication, “In truth [en verdad], Clarice Lispector” (7), and with a signature inserted in the list of potential, but discarded, titles for the novel. And yet even these gestures of showing the author’s hand are themselves misleading. For the author of the dedication is not “in truth” Lispector in that there is no reason why we should expect to believe that this is her own voice any more than we can believe her stand-in, to whom she has given the name of Rodrigo S. M. And just the same goes for her as goes for Rodrigo when he asks himself “Or am I not an actor? In truth [en verdad] I’m more of an actor because with only one way to punctuate, I juggle with intonation and force another’s breathing to accompany my text” (24). Lispector, too, can do no more than juggle with the limits imposed upon her by grammar and writing. And the signature she gives us, as though it were the proof of some legal claim to the text, the trace that confirms the contract made with the reader, is but a mass-produced image, identical on every copy sold. Language and the market together work to erase individuality; and yet they are also the tools with which we endlessly try to distinguish ourselves. Macabéa, in turn, is also a creature and victim of these same forces, neither more or less than Rodrigo S. M. or Clarice Lispector, though her existence is rather more precarious than that of either the presumed authors. One sign of this is that she is blessed only with a first name, and even that is withheld until almost halfway through the book. The man that becomes briefly her boyfriend, who asks her for her name and so allows it be revealed to the reader, is endlessly fretting about how to make a name for himself. He does so literally as he declares that he is “Olímpico de Jesús Moreira Chaves” when in fact “all he had for a surname was Jesús, the surname given to those without a father” (49). Likewise, Olímpico is keen to feign knowledge and mastery of language in general, blustering or brushing Macabéa off when she comes to him with new words that she has heard on the radio or elsewhere: “What does ‘culture’ mean? –Culture is culture, he continued sulkily. [. . .] ‘What does ‘per capita income’ mean? –Oh, that’s easy, it’s something for doctors” (55). Macabéa, on the other hand, is often literal-minded in her approach to language. “Look, Macabéa,” Olímpico says to her at one point. “What is there to look at?” she responds. “No, my God, no, there’s a ‘Look’ that has to do with looking and a ‘Look’ that’s when you want someone to listen to you. Are you listening to me?” (60). Everywhere, even in the simplest of interjections, language threatens to trip up authors and characters alike. Meanwhile, Macabéa is equally a creature of the market: almost literally so, in that her diet apparently consists entirely of hot dogs and Coca Cola. Likewise, her dream comes directly from mass culture: to be a film star, like Marilyn Monroe. This is the “hour of the star,” the hour of one’s death in which “you become like a blazing cinema star, it’s everyone’s moment of glory” (31). When, ultimately, Macabéa ends up dying on the roadside, hit (ironically or appropriately enough) by a yellow Mercedes whose driver doesn’t bother to stop to see the damage he’s caused, it’s not immediately clear that this is the longed-for hour of the star. But Lispector (or Rodrigro S. M.) suggests that it’s only in this moment that Macabéa is born, “born for death’s embrace” (93). And it’s only, lying there, that she becomes woman. But this is a strange kind of becoming: neither subject nor object (for in truth in most of her short life, she’s never been either), the last words we hear her say, “clearly and distinctly,” is the phrase “And as for the future” (94). This is a future that seems closed off to her, as much as it had ever been, except that she has been immortalized, however reluctantly, by the author(s) whose frame of reference she forever escapes. Yes. Cómo podemos acceder al libro? No está disponible en bookstore. It’s interesting how the author makes it seem as if the character is for her, as if she was the only one who saw any value in her–but (as you state) so readily and “without compassion” gives her up in the end. It’s almost as if she used Macabeá to try and work out some type of meaning and purpose in life, finds it futile, and then in a fit of nihilism–throws her away. “For her”? “She was the only one”? Aren’t you confusing author and narrator here? Or, perhaps confusing the two authors: Rodrigo S. M. and Clarice Lispector? Not, of course, that they can be entirely disentangled.